Liverpool is always ahead when it comes to creative events that get people interacting. Ping! Liverpool is no exception. On June 29th ‘Ping! Liverpool’ in association with CALM will unveil a new exhibition called Spin! at the awe-inspiring Camp And Furnace, billed as an antidote to the super-slick and a celebration of simple things. The Spin! Exhibition celebrates creativity in Merseyside. Contributors lined up for this unique exhibition include; The Wombats, Kirsty Doyle, Horse, Slazenger Heritage, Dunlop, Mercy, Milk:, Smiling Wolf, Luna, Non Conform, FVMA, Nook & Willow, Automatic Trout, See White, Sam Steele, Nathan Pendlebury, Robyn Woolston and our very own client Craft Creative. These one of a kind designs will be auctioned online from the 29th June to 26th July and proceeds will be donated to CALM, whose inspiring work helps reduce suicide rates amongst men under 35, currently the single biggest killer of young men in the UK. The designer with the highest-selling Paddle will be presented with an award at the Ping! 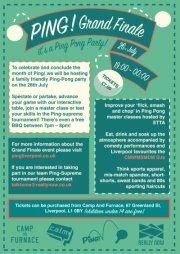 Finale event at Camp And Furnace on the 26th July.